Claire spent the first seven years of her veterinary nursing career at a large mixed first opinion practice in Hampshire where she gained her VN qualification. She joined SCVS in July 2009 as a general nurse gaining valuable skills within each discipline prior to specialising in medical nursing. As Senior Medical Nurse, Claire is responsible for the daily running of the dispensary. 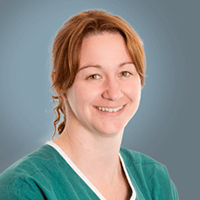 Claire achieved her RVC Graduate Diploma In Professional and Clinical Veterinary Nursing in September 2012.